For This Company There’s Never Been A Better Time To Be In The Oil Business | Energy and Gold Ltd.
Jericho Oil is committed to reaching 1,000 barrels of oil per day of production by Q3 2016. The fallout from the oil sector downturn has created a unique opportunity for attractive acquisitions of existing oil producing assets in the mid-continent region of the U.S. – production can be purchased for much cheaper than it can be drilled for. Towards the end of 2015 Energy & Gold was looking for companies who were doing just this, buying the blood among the oil sector carnage, by snapping up attractive energy assets at depressed prices. This led us to come across Jericho Oil Corporation (JCO.V) and we were quickly impressed with the company’s disciplined tactical approach to profit from market dislocations in the mid-continent region of the U.S.
CEO Allen Wilson has installed his core beliefs into the company and it shows in how Jericho operates and acquires new assets. Operating like a true Scotsman where every penny is his prisoner Mr Wilson has made several key moves through one of the oil sector’s ugliest downturns ever. On December 29th, 2015 Jericho completed a $7m financing which allowed Jericho to close on its latest acquisition a day later. While most investors are fleeing from the energy space and most oil & gas companies are shedding assets, Jericho Oil is plowing money into legacy oil assets with existing production in the mid-continent region of the U.S.
Jericho’s strategy is to continue to acquire existing production for far cheaper than it can be discovered with the drill bit. Jericho is ruthlessly disciplined when it comes to analyzing potential deals to ensure that acquisitions are accretive from day one. Projects should be turned around into profitability within one quarter at the current price of oil. The vicious oil sector downturn has created a unique environment in which it is cheaper to purchase production than it is to drill for it – Jericho has been taking advantage of this opportunity while being prepared to unlock organic growth during a rising oil price environment. 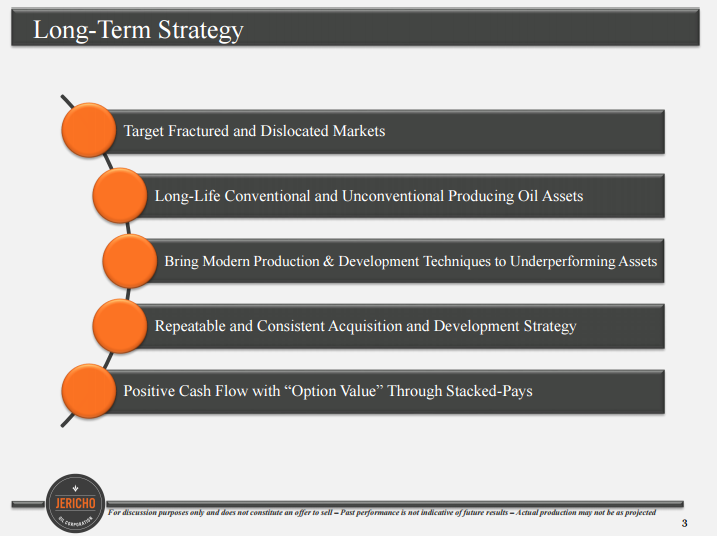 Jericho has been successfully adding to its land bank for when prices do come back without sacrificing its model for weathering and profiting during a “lower for longer” oil price environment. Jericho hasn’t just been adding to its portfolio of producing oil assets, the company has been adding to its corporate team with a couple of key additions that could really elevate Jericho’s game in 2016. Kirk Kolar who has over 30 years of experience in the oil industry and has worked with majors such as Shell specializing in the mississippi lime (a target area which Jericho has been focusing on). Brian Weatherl, classically trained oilman with another 30 years of experience, mainly with Chevron and will bring the engineering expertise to Jericho and lastly but not least Bill Harwell, who has over 30 years of land experience in the industry as well. With these three additions Jericho has added almost 100 years of mid continent oil drilling and exploration expertise to the team. During the salad days of 2010-2014 there was a lot of debt-financed drilling in the U.S. oil & gas space. This drilling was largely not accretive for the companies that carried it out. Combine the major energy sector washout of the last 18 months with a huge debt overhang and the results are the forced asset sales and restructurings we are currently witnessing across the energy sector. 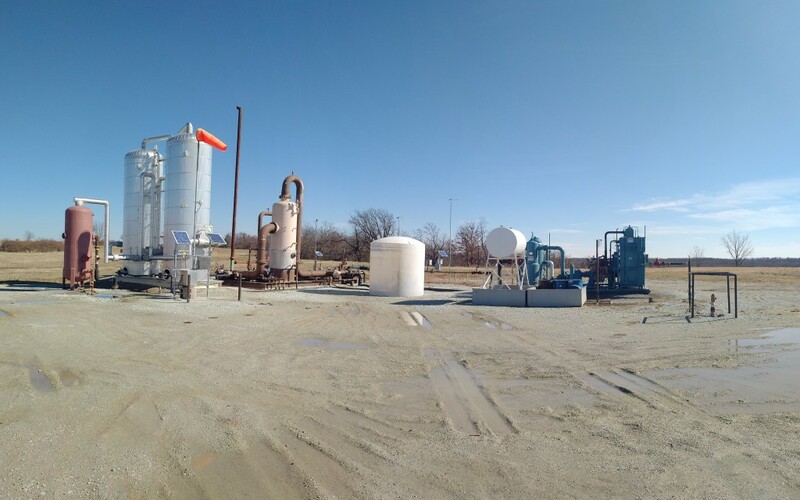 With zero debt, a strong investor base, including the Breen Trust (JCO’s largest shareholder) and a team of seasoned mid-continent oil veterans, Jericho Oil Corporation couldn’t be better positioned to seize what is shaping up to be a generational investing opportunity in mid-continent oil assets. E&G will continue to closely follow Jericho and keep readers apprised of the company’s progress towards its 1,000 boe/day and eventual 10,000 boe/day goals. The article is for informational purposes only and is neither a solicitation for the purchase of securities nor an offer of securities. Readers of the article are expressly cautioned to seek the advice of a registered investment advisor and other professional advisors, as applicable, regarding the appropriateness of investing in any securities or any investment strategies, including those discussed above. JCO is a high-risk venture stock and not suitable for most investors. Do your own due diligence and consult a licensed investment advisor prior to making investment decisions. Consult Jericho Oil Corp. SEDAR profile for important risk disclosures.